Variable are used in C++, where we need storage for any value, which will change in program. Variable can be declared in multiple ways each with different memory requirements and functioning. 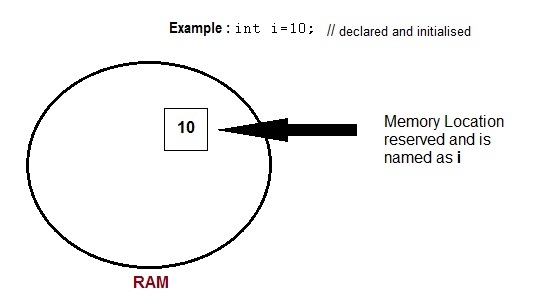 Variable is the name of memory location allocated by the compiler depending upon the datatype of the variable. char For variables to store character types. Variable must be declared before they are used. Usually it is preferred to declare them at the starting of the program, but in C++ they can be declared in the middle of program too, but must be done before using them. If a variable is declared and not initialized by default it will hold a garbage value. Also, if a variable is once declared and if try to declare it again, we will get a compile time error. Global variables are those, which ar once declared and can be used throughout the lifetime of the program by any class or any function. They must be declared outside the main() function. If only declared, they can be assigned different values at different time in program lifetime. But even if they are declared and initialized at the same time outside the main() function, then also they can be assigned any value at any point in the program. Local variables are the variables which exist only between the curly braces, in which its declared. Outside that they are unavailable and leads to compile time error. There are also some special keywords, to impart unique characteristics to the variables in the program. Following two are mostly used, we will discuss them in details later. Final - Once initialized, its value cant be changed. Static - These variables holds their value between function calls.